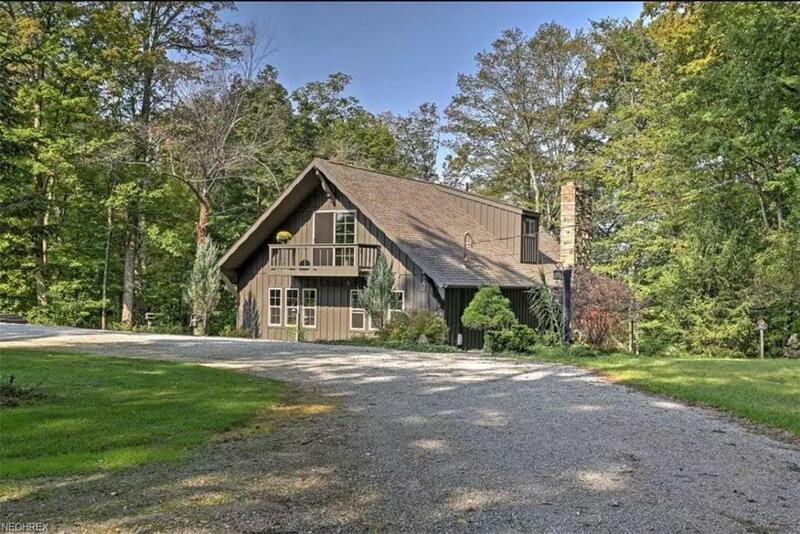 Welcome to this warm and inviting home tucked away on 7+ wooded acres overlooking the Vermilion River, with stunning views coupled with today's modern updates and all the charm of a rustic retreat. Open floor plan allows unobstructed views of the changing seasons. Great room offers massive brick fireplace and access to the scenic back deck. Newly updated kitchen with breakfast bar is open to the cozy family room. First floor master suite with gorgeous knotty pine private bath. Two generously-sized bedrooms on the upper level, each with their own private deck, separated by the updated second full bath. The lower level features two areas ideally suited for recreation space plus laundry, workshop and ample storage. Full walk-out basement provides an additional covered patio area to drink in the awe-inspiring views. Four car garage stores your cars and all your toys to enjoy the outdoors. You will love the home's proximity to Cedar Point, Vermilion, Oberlin, Put-In-Bay and Kelley's Island! This wonderful retreat has even generated substantial income as a short-term rental property. Truly a unique rural escape for your primary residence, second home or a proven vacation rental business opportunity. No local income tax.